Start With a Sugar Cookie Mix And... Make Snickerdoodles! Yes, my regular readers know that I don't buy cookie mixes. I don't have them on hand. I don't use them. But I know most of my friends do and I know that kids, friends and family probably don't care if they are completely homemade or not. When you take a pan of hot, fresh baked cookies out of the oven, the aroma transcends any preconceived notions of whether or not starting with a package mix is ok or not! When I received a Betty Crocker email that had this recipe in it I immediately thought of a couple of my busy Mommy friends who do have cookie mixes on hand and how they might love to have a recipe like this one. Quick and easy they can pull off cute little Christmas cookies in no time! Hope you enjoy it too. Heat oven to 375°F. In large bowl, stir cookie mix, flour, butter and egg until dough forms. Shape dough into 1-inch balls. In small bowl, mix sugar and cinnamon. Roll balls in sugar-cinnamon mixture. Place 2 inches apart on ungreased cookie sheets. Bake 11 to 12 minutes or until set. Cool 1 minute. Remove from cookie sheets. 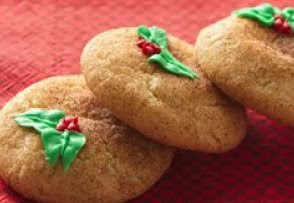 If desired, roll tops of warm cookies in additional sugar and cinnamon mixture. Cool completely, about 20 minutes. Decorate as desired using icing. I am an absolute pushover for green olives. I love the salty taste, the texture... I love everything about them and the fact is, olives are one of the earliest food memories I have. I literally cannot remember a time when I didn't eat them. First, by plucking out the red pimento inside and sticking them on my fingers and eating them off one by one and later, one of my favorite sandwiches (that I still eat once in a while to this day) are cheese and olive sandwiches; 2 buttered slices of bread with a slice of American cheese, a ton of sliced green olives and squished together firmly between my palms to keep the olives from falling out. It's a comfort food from my high school and junior high days and one that makes my mouth water just thinking about the salty goodness! That said, you'll understand my excitement a few years ago when I found a couple olive salad recipes. I added this one to my list to make on one of the 'holidays' and really, I should have made this one yesterday for Thanksgiving but I'm going to tuck it into my brain to make for our extended families Christmas Eve celebration as I come from a family of 'olive lovers' and I know it will be a hit! Mix all ingredients together and marinate at least 24 to 48 hours before serving. Todays recipe is a copy cat recipe for the Aussie Bites that you can buy at membership warehouses. Someone brought in a container to work this week and we've all been enjoying them in the break room. I had one today and while studying it for ingredients decided it was basically a chewy granola bar, but made in a little muffin tin. Combine the dry ingredients and fruit into a bowl. Heat the butter and honey in the microwave, stir in the oil and add to the dry ingredients. Place a heaping tablespoon full into mini muffin pans and press down firmly. Bake at 350 degree's 7-10 minutes until set and let cool. *I'm reserving the right to tweak this recipe and I'll update if needed after it's tried and true! I smile to post this because it's the third year in a row on this recipe blog that I've shared one of our Thanksgiving Traditions with my readers. Yes... Thanksgiving can officially take place now that I have the two dozen tiny mini turkey dinner cupcakes made! Starting with a frosted cupcake, topped with a cookie, you then spread a thin round layer of frosting. Using Brach's Maple Nut Candies for 'turkey', melted caramels for the 'gravy', white frosting 'potatoes' a dot of yellow food color gel for 'butter' and sugar crystal 'cranberries' with nonpareil 'green beans'; it only looks like a meat and potatoes kind of meal. It's really a sweet treat! Thanks to my blogs I've shared this 'recipe' many times and I'm happy to report that I now have many, many bloggers and friends and readers that make these (or similar using the products they can find in their own grocery stores) every year for their families. What a great tradition! Are you ready to start??? Today was the first snow of the season. A great Saturday morning to sit at the kitchen table, sip hot coffee and plan my Thanksgiving menu. I actually started a little bit of the 'cooking' already having made a pumpkin cheesecake yesterday and I baked the cupcakes today as well as the homemade cranberry sauce. I've spent the rest of the afternoon surfing online for Christmas gifts and ideas. If you have a few holiday parties coming up hopefully you will find more than a few appetizer ideas on my site. I've got a thousand more in my files and hopefully I'll be posting quite a number of them over the next few weeks. Today I give you another version of the ever popular 'ribbon' style sandwich. Beat the cream cheese and spices in a small bowl with the spices until smooth. Beat the butter with the parsley in a separate bowl. Spread 5 slices of the whole wheat bread with the cheese mixture. Top wtih 5 slices of white bread. Spread those with half of the butter mixture. Top with the chicken. Spread the remaining wheat bread with the butter mixture and place butter side down on the chicken. Cut the crusts from the sandwiches and cut the sandwiches into thirds to make 'ribbons' and then cut each of those into 3 bite sized pieces. This will give you 45 appetizers. Hard boiled eggs go fast in this household. With a husband and 16 year old son that love them they disappear so quickly I sometimes have to write on the outside of the shell not to eat it if I'm saving it for a salad or something. They also dearly love almost anything made with hard boiled eggs! This recipe is for those that love hard boiled eggs and sausage. Originally I believe this recipe was made with ground chicken and a few spices, but it's so delicious and so easy when using prepared ground breakfast sausage in its place! Hard boil eggs and allow to cool to room temperature. Shell the eggs and toss them into a little bit of flour. Shake off the excess. Shape a bit of sausage around each egg, encompassing it. Dip each egg into the beaten egg and coat in crumbs. Just before serving deep fry the eggs in hot oil. Drain. Cut in half for an appetizer or serve whole for a breakfast treat. With Thanksgiving right around the corner the holidays are ready to kick off! And with that comes a lot of parties and get-togethers. This means; lots of finger foods! So I'm hoping to try to get many little appetizers and finger foods on here in the next couple weeks. I have to start doing some of my holiday baking as well - the kids are anxious for Moms 1,000 Christmas cookies! My family loves salmon and also loves puff pastry. Put the two together and you have a quick, easy appetizer that looks impressive and is so yummy! *note* I thought I had a photo of this one but a quick glance through my files isn't locating it. I'll add it if and when I get time as I KNOW I took one! LOL. They look like tiny little cream puffs but instead of being 'filled' they are topped. Remove the rind from the cheese and cut into thin 2 inch squares. Cut tiny 2 inch rounds from the pastry, place them in tiny tart trays if you have one, if not, an ungreased baking sheet will do. Top them with the cheese slice. Bake the puffs at 350 for about 25 minutes. Remove from the tray and immediately top with a slice of salmon, a tiny little triangle of lime and a sprig of dill. As you stand in front of the hot, roasted delicious turkey you now have to decide; how do you get it from the roasting pan to the serving platter without it falling apart or on the floor? Honestly, I think Grandma had the best idea; scrunch up paper towels or aluminum foil in each hand as a buffer between the turkey and your hands and then lift and move... really fast! Over the years I've used oven mitts that had to immediately go into the laundry afterwards, I've always used spatulas, tongs and other devices. Wooden spoons inserted inside the bird, even a mixture of all of the above! Whatever works for you works for me! No one will see you do this part anyway. But now... you have to carve it! I found this step by step picture of how to carve a turkey that I must have found years and years ago as I had it clipped and taped to the inside of one of my hand written notebooks. I thought it would be perfect to post on the blog to help my readers too! In the end however, if you are unsure of your carving skills, I suggest this: Do it in the kitchen! Away from prying eyes. Bring the bird to the table for the Thanksgiving prayer and then walk it back to the kitchen, carve away and return to the table with a platter full of sliced and carved turkey for the masses. No one will see how you cut it! They'll just see the beautiful and yummy finished product! There is a reason this one is always seen at parties and get-togethers. It's just that good. I personally serve bacon wrapped shrimp often in our home, and this is similar. Bacon Wrapped Scallops. This recipe has a bit of a teriaki flavor to it. Combine the marinade and scallops. Refrigerate 3-4 hours. Cut each slice of bacon in thirds and wrap scallops. Secure with toothpicks. Broil the bites in the oven until the bacon is browned and crisp. Serve. These can also be made a day ahead and then broiled before serving. It's the kick off of the holiday season. A time of house parties, work parties and well, parties! What makes a great party is not only the crowd invited but the food served. I, like most people really love a lot of different appetizers being served rather than a heavy meal. This 'grazing' style is perfect as the individual portions are neat and easy to eat, are the perfect 'trial' size (because you never know if you'll like something or not) and it's always good to have something in your stomach if you are also serving drinks. Lastly, a nice selection of appetizers is much, much better than opening a bag of chips and calling it 'done'. I found an old budget recipe book in my files - one of those that probably didn't go far when it was first printed as it's the one you find in the clearance bin of the dollar store. There is a good reason for that - There are many typo's and little goof-ups in the book but almost anyone could recognize them and knows what to do. (Like it will tell you to add the sugar to the butter, vanilla and milk mixture... but it never told you to mix the butter, vanilla and milk together in the first place!) Don't worry - I'll catch and correct their goofs before I add them to my collection here. Yet, I love all recipe books, big, small, expensive, or even the freebies. I adore recipes and love food and cooking so they are all equal in my eyes! Combine the egg and milk in a small bowl. Toss squid in cornstarch, shake away the excess and dip in the egg and milk mixture. Dredge in the crushed corn chips. Press the crumbs on firmly and cover and refrigerate 1 hour. Deep fry the squid in hot oil about 30 seconds until done. Drain on paper towels. Serve hot with sauce. Heat oil in pan. Add garlic, curry powder, turmeric. Cook fo r2 minutes. Remove from heat. Blend the cornstarch with 1 T of the coconut cream. Stir into the curry mixture with sugar. Return to heat. Gradually stir in the rest of the cream. Stir until it boils and thickens. Simmer 1 minute and serve. This post is just making me shake my head to write it. You see, I had to work so long and hard to find this recipe! And it's kind of a cute story so I'm going to share. First off, I have no idea what this recipe is really called. A long time ago I saw a picture of some cookies or bars that just looked so amazing and delicious, the image stuck in my brain. Although I don't remember when or where I know I was reading something online and came across the photo again so this time I saved a copy of it in my files. I did not have a recipe to go with it, I had no idea where it came from, but I couldn't get the image out of my head! A few weeks ago I was bored and had some 'down' time to de-stress and just surf the internet a little bit when I came across a post on a message board that wasn't very eye catching, but I clicked on the title anyway. I have no idea why. Suddenly, there it was. MY picture! The picture I had saved and saved and saved.... hoping to some day track down a recipe to go with it. And it was right in front of me! I was so excited I immediately cut and pasted the recipe to a word file and saved it, but in my rush I neglected to paste the name of the recipe. LOL. So I have no idea what they are called, but they remind me of Christmas and also of an Italian flag with the red, green and white layers. All I know is have almond paste in them (which is a LOVE of mine) and I want to make these this Christmas! And now... I finally (finally!) have the recipe. And you do too. You'll need a heavy-duty stand mixer for this recipe! Put oven rack in middle position and preheat oven to 350°F. Butter a 13X9" baking pan and line bottom with wax paper, leaving a 2-inch overhang on 2 ends, then butter the paper. Switch to a paddle attachment, then beat together almond paste and remaining 3/4 cup sugar until well blended, about 3 minutes. Add butter and beat until pale and fluffy, about 3 minutes. Add yolks and almond extract and beat until combined well, about 2 minutes. Reduce speed to low, then add flour and salt and mix until just combined. Bake red layer 8 to 10 minutes, until just set but still undercooked! Using paper overhang, transfer layer to a rack to cool, about 15 minutes. Clean pan, then line with wax paper and butter paper in same manner as above. Bake white layer in prepared pan until just set. As white layer bakes, bring green batter to room temperature. Transfer white layer to a rack. Prepare pan as above, then bake green layer in same manner as before. Transfer to a rack to cool. When all layers are cool, invert green onto a wax-paper-lined large baking sheet. Discard paper from layer and spread with half of preserves. Invert white on top of green layer, discarding paper. Spread with remaining preserves. Invert red layer on top of white layer and discard wax paper. Cut lengthwise into 4 strips. 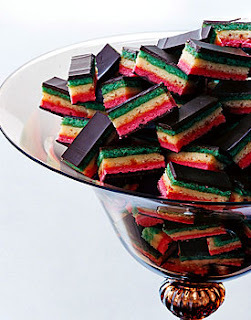 Cut strips crosswise into 3/4-inch-wide cookies. About a week or two ago I posted photos and a recipe of the jello cake I made. One of the few desserts from my own childhood, we loved jello cake so much, one of my brothers would request it for his birthday cake. This is another version - one I got from a magazine I believe (?) although I don't remember which one anymore. I love the raspberry/lemonade mixture and I think it would be wonderful in the Spring or Summer. I couldn't wait to get the time to add it to my online collection so it will be here for me next Spring when our Midwestern weather turns warm again and our 7 month winter is over! Spray the bottom only of a 9X13 inch pan and dust with flour. Mix the hot water and gelatin until gelatin is completely dissolved; cool slightly. In large bowl, beat cake mix, 1/4 cup of the gelatin mixture, 1/4 cup of the lemonade concentrate, the water, oil, and egg whites with electric mixer on low speed 30 seconds. Beat on medium speed 2 minutes. Pour into your prepared pan. Reserve the remaining gelatin mixture and lemonade concentrate. Bake 30 to 35 minutes or until done. Poke the warm cake all over with a fork. Remove 1 tablespoon of the reserved gelatin mixture to microwavable custard cup or small bowl. In another small bowl, mix remaining gelatin mixture and remaining 1/4 cup lemonade concentrate; pour slowly over cake. Cool completely, about 1 hour. In medium bowl, fold together the frosting and whipped topping; frost cake with it. Microwave the 1 tablespoon gelatin mixture you reserved, uncovered about 10 seconds to liquefy. Using 1/4 teaspoon measuring spoon, place small drops of gelatin mixture over frosting; with spoon or toothpick, swirl gelatin into frosting. Garnish each piece with raspberries and lemon peel strips. Store covered in refrigerator. To baste or not to baste? Basting that Thanksgiving Turkey. First... let me tell you that I grew up watching my Grandmother, Aunt and Mother all baste turkeys. I assumed it was to keep the turkey moist. But my other Grandmother baked hers in a large roaster in the basement and never once basted it, yet hers was always especially moist - albeit pale in color so she always stuck it in the oven for a few minutes just before presenting to give it a beautiful golden color. I can't say I've always been a regular baster... remembering some years, not others. Sometimes only once, sometimes 5 or 6 times. See? Never regular, yet my turkeys have always been pretty darn good if I do say so myself. Here is another reason not to baste; do you remember what your Grandmother or Mother taught you about not opening the oven while your food is cooking? You lose heat every time it's opened, which means your meal takes longer to cook. Every time you open that oven door you let heat escape. Instead, use butter or oil and skip the basting. And if it's getting too dark for your tastes? Cover it in foil. I like to cover in foil at the beginning, bake it that way and then remove the foil the last hour or so. So... happy basting... or not. If you are organized, or you remember in time and there is no rush, thaw the turkey in the refrigerator like the directions on the turkey package say because the turkey people are afraid you are going to sue to them if you thaw it any other way. Keep it in the original packaging, and place it in a container to catch any juices that may leak out, allowing approximately 5-6 hours per pound. Now, for the rest of us that don't have time, forgot to get it out of the freezer in time, or underestimated just how many pounds of turkey we bought and find out too late that it's still frozen - this part is for us! Fill the kitchen sink with cool water and drop mister bird in - completely encased in the original wrapper, breast-side down. (Water is a much better conductor of heat than air in the refrigerator, so this method works faster). If the turkey has been defrosting in the refrigerator for several days, you may find it's ready in less than an hour. If you need to defrost a fully frozen turkey really, really fast; allow half an hour per pound. The U.S. Department of Agriculture advises changing the water every 30 minutes or so and no matter what your Grandma or Mom does, they also advise not thawing it on the kitchen counter. Ok... I'm a little embarrassed. I knew my 'Tofu Nuggets' recipe was easy... but I had forgotten just how easy it was. As I flipped through 10 of my handwritten notebooks last night searching for the right recipe (because I have a few of them but I knew the one I wanted was hand written, in pencil and scrawled in a quick, unorganized way on the page. When I saw it, I laughed. It's been a couple years since I made this one... and could it really be that simple? Yes... apparently it can. Dip the cubed tofu nuggets into the breading mix. Place on an oiled baking sheet and bake at 350 approximately 15 minutes until golden. Depending on the Shake N' Bake mix you use these are either copycats for chicken nuggets or fish sticks/nuggets. The first time I made these I had a friend visiting while I baked them and she, nor any of our 5 combined children could tell they were tofu. They all thought they were fish sticks! The condiment you choose (ketchup, honey mustard, tartar sauce) depends on the mix and what you want the tofu to taste like as the tofu takes on the flavor of the mix it's made with. I'm having a blast going through my old handwritten notebooks filled with recipes. I'm ultimately looking for an old tofu nugget recipe I would make that tasted just like fishsticks, but in the mean time I'm finding so many delicious recipes that I haven't made in a long time! (That's what you get when you have about 900,000 recipes... LOL). This one is a great appetizer, just in time for the holidays! Preheat oven to 450. In skillet cook onion in butter and oil over medium heat for 10 minutes, stirring occasionally. Stir in the sugar, vinegar and dates. Cook and stir 5 minutes more until heated through and the onions are golden brown. Remove from heat. Stir in almonds. Sprinkle the cheeses over the pizza/bread crust. Top with the onion mixture. Place the bread/pizza crust on an ungreased baking sheet. Bake 8 minutes until cheese is melted. Let stand 5 minutes then cut into squares. Tonight I was thinking about a tofu recipe I used to make in 2001 when I was in the middle of a huge 'tofu' kick and used it almost weekly. Although I didn't find the tofu nugget recipe I was looking for, I did find a lot of my old recipes and thought perhaps I'd post a few on the recipe blog. Right now with groceries being as expensive as they are, a lot of people will be turning to alternative ideas, and tofu is an excellent way to replace meat in a dish or in certain things, supplement the ground beef by using half and half. More on that one later! Right now let's start with an eggless egg salad recipe. Yum! Drain tofu and pat dry with paper towels to remove moisture. Grate the tofu with a cheese grater. Mix the rest of the ingredients together and then lightly stir and toss with the tofu. Refrigerate for 30-60 minutes to let the flavors meld. Ok! Well, so tonight is taco salad and my daughters requested it be served with a Baja Sauce. Their wish is my command, and benefits you as well. There is a LOT of room to play with this recipe as you and your family see fit. Add, delete, adjust as you like. You know I expect you to! Play with your food! LOL. First - make the sauce so the flavor has time to meld before serving. If you can make it at least 6-12 hours ahead of time, great! But if not, that's ok too. Try to get at least 30 minutes of 'sitting' time if you can. So simple yet so incredibly good. A slice of my childhood. When I was young my Mom didn't make a lot of cakes. As a matter of fact I remember my Dad making banana cakes more than I remember my Mom baking cakes. We would each get an angel food cake for our birthday but other than that we didn't really have desserts in our home until I was old enough to cook by myself. From then on out I was always making cookies, cupcakes or cakes. The only cake we did find once in a while is a jello cake. It was a family favorite; so much so that one of my brothers started to request it instead of the traditional angel food for his birthday. So simple and quick because it starts with a cake mix and the only additional ingredients you need other than what your cake calls for is a box of jello, some water and a container of whipped cream. Of course you know I always play with a recipe so I added a few extras, but you can do a simple white cake mix, jello and call it 'good'. Bake your cake as directed on the box for the simple version. Mix all and bake as directed plus about 15-20 minutes extra if you make the cake with the additional ingredients as I did. When done remove from oven and place on heat safe surface. Heat the water to boiling. Add the package of jello and stir to dissolve. Use a skewer, straw, shish-ka-bob or other thin utensil to poke holes all over the cake. Carefully and slowly pour the hot jello mixture to cover the entire cake. Use whipped cream or whip the Rich's brand with the heavy cream, powdered sugar and vanilla until stiff peaks form. Cover the cake. Slice and serve. Cover the cake in holes. Slowly pour the hot jello over. When completely covered, refrigerate at least 4-6 hours. Cover with simple whipped cream - not too sweet! Regular frosting tends to be far too overpowering for this cake. As a matter of fact I like it plain myself! Often I find myself doing something normal or typical for me or our household and it never occurs to me that others might not know or don't do it. That's what happened this morning so here I am, ready to share. A couple weeks ago we had some cold weather move into our area. My garden was still trying to produce vegetables for us now that the aphids had left and the pepper plants finally had a fighting chance! Outside, I picked all the peppers I could and brought them in the house before the freeze took them, but unfortunately 'life' got in the way and I never got around to doing anything with them. This morning I finally did. I rinsed, cleaned and seeded them, chopped them and placed them directly into a Ziploc baggy and tossed them into the freezer. Does anyone notice the step I 'skipped'? It's true. I never blanch my peppers. Once upon a time I did. But a garden overrun with jalapeno's one year I simply cleaned them and put them all into a large gallon freezer bag and froze them. Later I found they were perfect for chopping and using in everything from marinades and dips to casseroles and more. And I *always* had jalapeno's on hand! Later I used the same idea for green peppers and again, what a blessing to always have green peppers on hand for last minute nacho dips, chili, casseroles, mexican cooking and more! The only thing I hesitated on was red peppers. I primarily use those for 'fresh' foods like pasta salads and such. Things that aren't cooked and need a pleasing texture. However, after starting to buy my red peppers on sale at Costco to get in essence, 3-4 'free' when compared to the price of the same at the grocery store, I needed to use them up before they got too old. With nothing to lose, I chopped them and froze them as a test. When used in the next Italian pasta salad I was happily surprised with the texture and taste. I've never looked back! Now, whenever I find peppers on sale of any color (red, yellow, green, orange) I purchase what fits in my budget for the day and while I save one to use that week, I rinse, clean and chop the rest and pop them into a Ziploc. What a great feeling to consistently have peppers on hand for any last minute recipe!